In 1997, we began a research project involving some of Sam Francis paints with the Getty Conservation Institute. This study, which focused on two paintings from the 1970’s and 65 samples from Francis’s studio, resulted in a number of published articles in technical journals, as well as a short film produced by the Getty Museum, Los Angeles. As the research, though limited in scope, was highly informative, we have determined to conduct an expanded study, encompassing every decade of Francis’ oeuvre, including canvas and works on paper. Our aim is to add to the educational and research archives of Sam Francis, currently held at the Getty Research Institute, and to promote scholarship of modern paints and methods of the post-World War II painters. This year we have begun an exciting project with the Getty Conservation Institute that is expanding our initial Paint Methods project. We have taken hundreds of paint samples from Francis artworks across the decades. The publication entitled Sam Francis: The Artist’s Materials will be out in 2016. 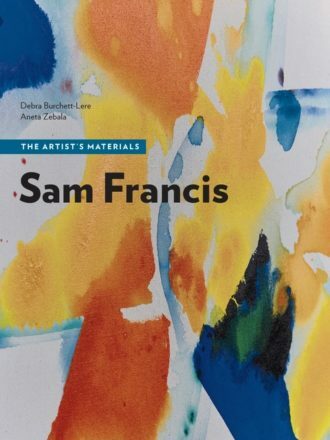 The Sam Francis paint study is the basis for scientific study and research with the Getty Conservation Institute co-authored by Debra Burchett-Lere and Aneta Zebala and preface by historian, Peter Selz. It is scheduled to be released as part of the illustrious group of publications by the Getty. As part of the GCI’s book series on modern paints: “The Artist’s Materials” Francis’s publication will join this series that includes Willem DeKooning, Lucio Fontana, and Jean Paul Riopelle in the near future. These publications are written for conservation scientists, conservators, specialists in modern art history, museums, galleries, research institutes, collectors, and the general public regarding the unique aspects of Francis’s painting styles. If you are interested in participating in this prestigious study please contact us directly.